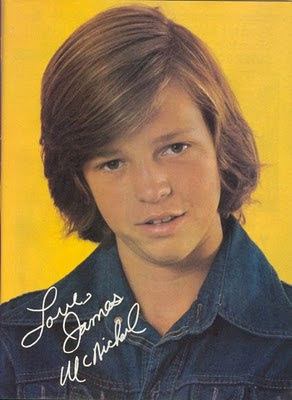 There continues to be much interest in Kristy McNichol and her brother Jimmy. One reader told me that Jimmy (who apparently prefers to be called James) divorced his wife Renee about five years ago. Jimmy and Renee have two children - a son named Nash and a daughter, Ellis (born 1998). I have not been able to verify that Jimmy and Renee are divorced and none of my readers has been able to provide me with any further information on the subject yet. If anyone out there in cyberland knows something more, please email me and TV Banter will be pleased publish your info. Two days ago, another reader referred me to a website showing a 1998 photo of Jimmy, Renee and their then-17 month old son Nash at home. The photo is by Anna Summa//Time Life Pictures/Getty Images. The photo's caption describes Jimmy as a "former teen idol turned environmentalist." To view this picture, click on the link below. The reader also remembered reading that Jimmy now lives in Colorado. I did a little online research and discovered that a James Vincent McNichol III, age 50, resides in Bayfield, Colorado. Jimmy turned 50 on July 2, 2011. At some point, McNichol moved from Southern California to Colorado. I don't know if he is still recording music. Back in 1996, he was recording under the name Jimmy James. In 1999, he was still performing with a band called Wizard King and released a CD titled Echo Warrior. He was also involved with a website focusing on eco-education called ECO TV. Over to you, readers. Let's have some serious banter. He lives in bayfeild colorado...He know works construction. His daugther and son have facebook accounts. He is a scam artist and lives with his wife and kids in Bayfield, Colorado. The reason I can speak on this is because my husband and I rented a cabin from him that was suppose to be "under construction" and finished by the time we moved in. He never finished it and never put a heater in the house which he said going to do. He said he was going to do alot of things. I had a newborn and we froze all winter because I was afraid if I broke the lease that I wouldn't get deposit back. He still didn't give us the deposit back. It was a nightmare and I am glad to be out and we are doing really well now! James McNichol is not a good person and neither is his wife. He is a washed up has been but still thinks he is in Hollywood! He also found out that he had a rapper daughter named Kellie Maize. Apparently, he slept with a woman at the Hershey Factory. Her music is pretty amazing though! Any other dirt ya want to know? Much can be found about him/her by checking the civil court records in California; they are well known as a Deadbeat Sociopath Land Fraud "Artist". What happened to you has been repeated multiple times in the past, including in past archival records from Los Angeles County. Stay clear of these scumbags. You are not alone, this couple has a long history of committing land fraud in California - Buyers Beware! Do you homework. This anonymous person above appears to be one in the same. Must not have much better to do than bash Jimmy(online mind you). I know him on a personal level, he does live in CO. I have rented one of his cabins at Valliceto lake and it was a great experience being on the water all winter, with no problems. His wife is a very pleasant person and is a great member of the community(including big ties with the la plata county animal shelter). I think this person is jealous of their family and land ownership.I checked out this La case claim, and there is a judgemnt in place, the McNichols won in the LA Federal court system. The apparent criminal was a women that goes by Pam Taylor, assisted by her husband, and reigning from Burbank CA. According to the case file, Jimmy and Rene Sold a home in Santa Barbata to the Taylor family and got burned with a TD that was never truly recorded by the Taylors. So get your facts straight it public info kiddo's. Although these claims have been cleared, the apparent jealousy hasn't. Stop trolling and use the web for knowledge not slander and lies. Do your own homework, dumdum, you obviously did only a simple search of CA records, these scumbags have land-fraud actions via LA County Records dating back 20+ years, defrauding folks with real estate transactions, BUYING/SELLING/NON-PAYMENT OF JUDGEMENTS/FELONY THEFT, etc...one of the JUDGEMENTS against them was for well over $50k in the 1990's - BUYERS BEWARE. That's dumb dumb stupid! Stop being a evil hater! We've all made bad choices as we are all still learning every day. Trying to survive. James is a good man and so is Kristy. James stood up as a man and took care of his kids and wife the best he could. He's not a drug dealer strung out on dope! He's made a good and simple/normal life for his family and must fight daily to keep a roof over theirs heads and fed. That's a real man. Despite what others try to say or claim He speaks volums from his actions. I would be ripped to shreds if I was in the public eye! RIPPED!! I recently told my family and daughter Rick Springfield's her bio father but only cause now that she's grown and can't be harmed from all the mean comments you haters out there are doing! BULLIES YOU ARE! people think almost all Horrywood people are perfect & do no wrong. In reality,a lot are addicts, perverts/hos, and have mental problems- just like the rest of the world. It's just that they and the public don't want to admit it. I never understood how people could worship, idolize, and be like such bad people. Good role models aren't popular anymore. And now the world is as bad as the bad role models they imitate. It's one big hellhole - literally. Jimmy just made a cameo appearance on the Real Housewives of Beverly Hills, where he showed up at an autograph event in which Kim Richards (another child star) was attending. She talked about having a big crush on him when they were young. It was cute. I know James and have a great deal of respect for him and his family. James always tries to do right to everyone. Life is hard, none of us are perfect, there is no such thing. Don't blame others for your own mistakes. Life does not come with an instruction manuel, we all learn how to live and every day something, unexpected or unknown, can be a learning experience. Can we all learn to help one another ... not for the worse .. but for the better ??? James tries to do this for everyone. It's not easy. Try it. Don't bash people for ther mistakes.. Admire and acknowledge the good in all. If you and I and everyone could do this we all could go far. LOVE, LOVE LIKE THERE IS NO HATE.